Home / About Arsenal Double Club / How Does it Work? 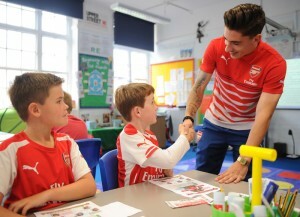 The Arsenal Double Club Languages programme is designed to be flexible and adaptable to your school’s needs. Simply order your resources online and start delivering your sessions! It is entirely your decision as to how many hours per week you spend using the materials, and you are free to pick and choose from the resources, working through them at your pupils’ pace. In the past, schools would run two 45-minute sessions, mirroring a football match. The first session would take place in the classroom, using the pupil workbooks and interactive resources, followed by the second half out on the playground or school field for a practical session using the coaching guide. Nowadays, however, schools simply integrate the resources alongside their existing provision for modern languages, in a way that fits in with the school’s timetable. There are no requirements, for example, to complete any number of practical sessions in order to complete the classroom resources. If running as an after-school club, then in terms of numbers, a minimum group size of 8-10 pupils is ideally needed to run a Double Club session effectively. We also suggest a maximum of 30 pupils, though split into two groups of 15 where possible, especially if you are following the traditional model of two 45-minute halves. When you have reached the end of the programme in school, you can arrange an exciting trip to Emirates Stadium for your group for a unique Language Day visit.